Hi! My name is Lindsay, and I am the Senior Officer for Physical Activity, Health & Wellbeing. 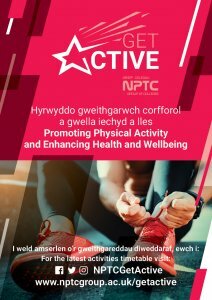 That’s not a very snappy job title, so we have come up with a new name: NPTC Get Active! Get Active! is a go-to hub for students and staff across NPTC Group of Colleges, where you can find out about all our latest initiatives and events promoting physical activity, health and wellbeing. The Get Active! team is made up of myself Lindsay Piper, Jonathan Nash who you can find at Brecon Beacons College and Helen Owen at Newtown. Research shows that physical activity can boost self-esteem and mood, improve concentration levels, sleep quality and energy, as well as reduce the risk of stress, depression, heart disease, dementia and Alzheimer’s disease. Our mission at NPTC Get Active! is to provide opportunities for our students and staff to engage in 30 minutes of physical activity, 5 days a week, to optimise the endless list of health benefits that exercise provides. Right now, a lot of our work focuses on engaging with specific student groups during tutorial sessions. We encourage staff to approach us with suggestions on the kinds of activities their groups would like to become involved with – we are always open to new suggestions and ideas! We will try our very best to tailor sessions to the needs of the group. We will soon be delivering a schedule of open classes across all campuses for both students and staff to participate in if they wish to. There are some classes already running, e.g. functional fitness in Llandarcy Academy of Sport at 1 pm on Wednesdays, netball at Neath College on Fridays at 12 pm. There’s rugby training (girls and boys) in Llandarcy on Wednesdays, and sessions in Brecon and Newtown Colleges…but these could change regularly! 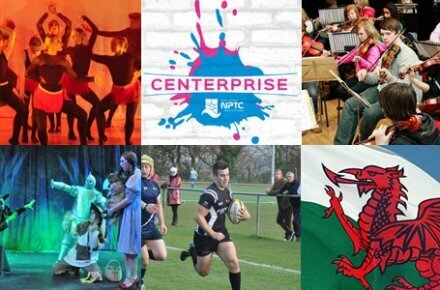 The best way to keep up to date with what’s going on is by following @NPTCGetActive on Twitter, & www.facebook.com/NPTCGetActive on Facebook and Instagram.